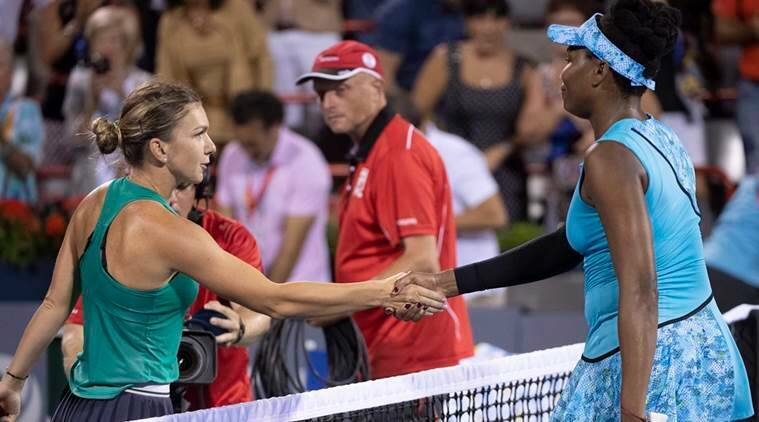 Simona Halep made quick work of Venus Williams 6-2 6-2 on Thursday to end a long day at the Rogers Cup that saw her advancing to the quarter-finals. Top seed Simona Halep made quick work of Venus Williams 6-2 6-2 on Thursday to end a long day at the Rogers Cup that saw her advancing to the quarter-finals. Halep had to grind out a 7-6(9) 4-6 7-5 win over Russian Anastasia Pavlyuchenkova earlier in the day, completing a match that began Wednesday but was halted due to rain. Pavlyuchenkova, ranked 28th, took leads of 2-0 and 4-2 in the third set but was unable to finish off Halep, who won three games in a row to seize a 5-4 advantage and eventually went on to break Pavlyuchenkova for match point in the 12th game. “It was a great match, a great fight. She played unbelievable and was fighting until the end,” Halep told reporters in an on-court interview. Against Williams, the 26-year-old Romanian saved the only break point she faced in the 74-minute match, and she converted five of her nine break opportunities. Second seed Dane Caroline Wozniacki went down in her first match of the tournament, losing 5-7 6-2 7-6(4) to Aryna Sabalenka of Belarus. Wozniacki was coming off a disappointing second round loss at Wimbledon and could not turn things around. Great Britain’s Johanna Konta was also forced to complete a pair of matches on Thursday. She finished off Belarus’ Victoria Azarenka 6-3 6-1 but lost later to fifth seed Ukrainian Elina Svitolina 6-3 6-4. “She was mentally more warmed up going into the match,” Svitolina said. “That’s what I thought. I was like, ‘C’mon, you have to be ready (because) she will be straight in the match.’ I think that really helped me.” France’s Caroline Garcia cruised past former world number one Maria Sharapova of Russia 6-3 6-2, the same score by which Dutchwoman Kiki Bertens upset eighth seed Czech Petra Kvitova. US Open champion Sloane Stephens, the third seed, beat Spain’s Carla Suarez Navarro 6-2 7-5 to book her spot in the quarter-finals, where she will face Latvia’s Anastasija Sevastova, a 6-3 7-6(2) winner over German 10th seed Julia Goerges. Belgian Elise Mertens, Australian Ashleigh Barty and Latvian Anastasija Sevastova also advanced with wins.